Not to be confused with Markup language or HTML element tags. Tagging was popularized by websites associated with Web 2.0 and is an important feature of many Web 2.0 services. It is now also part of other database systems, desktop applications, and operating systems. Tagging gained popularity due to the growth of social bookmarking, image sharing, and social networking websites. These sites allow users to create and manage labels (or "tags") that categorize content using simple keywords. Websites that include tags often display collections of tags as tag clouds, as do some desktop applications. On websites that aggregate the tags of all users, an individual user's tags can be useful both to them and to the larger community of the website's users. Metadata tags as described in this article should not be confused with the use of the word "tag" in some software to refer to an automatically generated cross-reference; examples of the latter are tags tables in Emacs and smart tags in Microsoft Office. The use of keywords as part of an identification and classification system long predates computers. Paper data storage devices, notably edge-notched cards, that permitted classification and sorting by multiple criteria were already in use prior to the twentieth century, and faceted classification has been used by libraries since the 1930s. In the late 1970s and early 1980s, the Unix text editor Emacs offered a companion software program called Tags that could automatically build a table of cross-references called a tags table that Emacs could use to jump between a function call and that function's definition. This use of the word "tag" did not refer to metadata tags, but was an early use of the word "tag" in software to refer to a word index. Online databases and early websites deployed keyword tags as a way for publishers to help users find content. In the early days of the World Wide Web, the keywords meta element was used by web designers to tell web search engines what the web page was about, but these keywords were only visible in a web page's source code and were not modifiable by users. "A Description of the Equator and Some ØtherLands", collaborative hypercinema portal, produced by documenta X, 1997. User upload page associating user contributed media with the term Tag. In 1997, the collaborative portal "A Description of the Equator and Some ØtherLands" produced by documenta X, Germany, used the folksonomic term Tag for its co-authors and guest authors on its Upload page. In "The Equator" the term Tag for user-input was described as an abstract literal or keyword to aid the user. However, users defined singular Tags, and did not share Tags at that point. In 2003, the social bookmarking website Delicious provided a way for its users to add "tags" to their bookmarks (as a way to help find them later);:162 Delicious also provided browseable aggregated views of the bookmarks of all users featuring a particular tag. Within a couple of years, the photo sharing website Flickr allowed its users to add their own text tags to each of their pictures, constructing flexible and easy metadata that made the pictures highly searchable. The success of Flickr and the influence of Delicious popularized the concept, and other social software websites—such as YouTube, Technorati, and Last.fm—also implemented tagging. In 2005, the Atom web syndication standard provided a "category" element for inserting subject categories into web feeds, and in 2007 Tim Bray proposed a "tag" URN. Many blog systems (and other web content management systems) allow authors to add free-form tags to a post, along with (or instead of) placing the post into a predetermined category. For example, a post may display that it has been tagged with baseball and tickets. Each of those tags is usually a web link leading to an index page listing all of the posts associated with that tag. The blog may have a sidebar listing all the tags in use on that blog, with each tag leading to an index page. To reclassify a post, an author edits its list of tags. All connections between posts are automatically tracked and updated by the blog software; there is no need to relocate the page within a complex hierarchy of categories. Some desktop applications and web applications feature their own tagging systems, such as email tagging in Gmail and Mozilla Thunderbird,:73 bookmark tagging in Firefox, audio tagging in iTunes or Winamp, and photo tagging in various applications. Some of these applications display collections of tags as tag clouds. There are various systems for applying tags to the files in a computer's file system. In Apple's macOS, the operating system has allowed users to assign multiple arbitrary tags as extended file attributes to any file or folder ever since OS X 10.9 was released in 2013, and before that time the open-source OpenMeta standard provided similar tagging functionality in macOS. Several semantic file systems that implement tags are available for the Linux kernel, including Tagsistant. Microsoft Windows allows users to set tags only on Microsoft Office documents and some kinds of picture files. Cross-platform file tagging standards include Extensible Metadata Platform (XMP), an ISO standard for embedding metadata into popular image, video and document file formats, such as JPEG and PDF, without breaking their readability by applications that do not support XMP. XMP largely supersedes the earlier IPTC Information Interchange Model. Exif is a standard that specifies the image and audio file formats used by digital cameras, including some metadata tags. TagSpaces is an open-source cross-platform application for tagging files; it inserts tags into the filename. A researcher may work with a large collection of items (e.g. press quotes, a bibliography, images) in digital form. If he/she wishes to associate each with a small number of themes (e.g. to chapters of a book, or to sub-themes of the overall subject), then a group of tags for these themes can be attached to each of the items in the larger collection. In this way, freeform classification allows the author to manage what would otherwise be unwieldy amounts of information. A triple tag or machine tag uses a special syntax to define extra semantic information about the tag, making it easier or more meaningful for interpretation by a computer program. Triple tags comprise three parts: a namespace, a predicate, and a value. For example, geo:long=50.123456 is a tag for the geographical longitude coordinate whose value is 50.123456. This triple structure is similar to the Resource Description Framework model for information. The triple tag format was first devised for geolicious in November 2004, to map Delicious bookmarks, and gained wider acceptance after its adoption by Mappr and GeoBloggers to map Flickr photos. In January 2007, Aaron Straup Cope at Flickr introduced the term machine tag as an alternative name for the triple tag, adding some questions and answers on purpose, syntax, and use. Specialized metadata for geographical identification is known as geotagging; machine tags are also used for other purposes, such as identifying photos taken at a specific event or naming species using binomial nomenclature. A hashtag is a kind of metadata tag marked by the prefix #, sometimes known as a "hash" symbol. This form of tagging is used on microblogging and social networking services such as Twitter, Facebook, Google+, VK and Instagram. A knowledge tag is a type of meta-information that describes or defines some aspect of a piece of information (such as a document, digital image, database table, or web page). Knowledge tags are more than traditional non-hierarchical keywords or terms; they are a type of metadata that captures knowledge in the form of descriptions, categorizations, classifications, semantics, comments, notes, annotations, hyperdata, hyperlinks, or references that are collected in tag profiles (a kind of ontology). These tag profiles reference an information resource that resides in a distributed, and often heterogeneous, storage repository. Knowledge tags are part of a knowledge management discipline that leverages Enterprise 2.0 methodologies for users to capture insights, expertise, attributes, dependencies, or relationships associated with a data resource. :251 Different kinds of knowledge can be captured in knowledge tags, including factual knowledge (that found in books and data), conceptual knowledge (found in perspectives and concepts), expectational knowledge (needed to make judgments and hypothesis), and methodological knowledge (derived from reasoning and strategies). These forms of knowledge often exist outside the data itself and are derived from personal experience, insight, or expertise. Knowledge tags are considered an expansion of the information itself that adds additional value, context, and meaning to the information. Knowledge tags are valuable for preserving organizational intelligence that is often lost due to turnover, for sharing knowledge stored in the minds of individuals that is typically isolated and unharnessed by the organization, and for connecting knowledge that is often lost or disconnected from an information resource. In a typical tagging system, there is no explicit information about the meaning or semantics of each tag, and a user can apply new tags to an item as easily as applying older tags. Hierarchical classification systems can be slow to change, and are rooted in the culture and era that created them; in contrast, the flexibility of tagging allows users to classify their collections of items in the ways that they find useful, but the personalized variety of terms can present challenges when searching and browsing. When users can freely choose tags (creating a folksonomy, as opposed to selecting terms from a controlled vocabulary), the resulting metadata can include homonyms (the same tags used with different meanings) and synonyms (multiple tags for the same concept), which may lead to inappropriate connections between items and inefficient searches for information about a subject. For example, the tag "orange" may refer to the fruit or the color, and items related to a version of the Linux kernel may be tagged "Linux", "kernel", "Penguin", "software", or a variety of other terms. Users can also choose tags that are different inflections of words (such as singular and plural), which can contribute to navigation difficulties if the system does not include stemming of tags when searching or browsing. Larger-scale folksonomies address some of the problems of tagging, in that users of tagging systems tend to notice the current use of "tag terms" within these systems, and thus use existing tags in order to easily form connections to related items. In this way, folksonomies may collectively develop a partial set of tagging conventions. Despite the apparent lack of control, research has shown that a simple form of shared vocabulary emerges in social bookmarking systems. Collaborative tagging exhibits a form of complex systems dynamics (or self-organizing dynamics). Thus, even if no central controlled vocabulary constrains the actions of individual users, the distribution of tags converges over time to stable power law distributions. Once such stable distributions form, simple folksonomic vocabularies can be extracted by examining the correlations that form between different tags. In addition, research has suggested that it is easier for machine learning algorithms to learn tag semantics when users tag "verbosely"—when they annotate resources with a wealth of freely associated, descriptive keywords. Tagging systems open to the public are also open to tag spam, in which people apply an excessive number of tags or unrelated tags to an item (such as a YouTube video) in order to attract viewers. This abuse can be mitigated using human or statistical identification of spam items. The number of tags allowed may also be limited to reduce spam. Some tagging systems provide a single text box to enter tags, so to be able to tokenize the string, a separator must be used. Two popular separators are the space character and the comma. To enable the use of separators in the tags, a system may allow for higher-level separators (such as quotation marks) or escape characters. Systems can avoid the use of separators by allowing only one tag to be added to each input widget at a time, although this makes adding multiple tags more time-consuming. A syntax for use within HTML is to use the rel-tag microformat which uses the rel attribute with value "tag" (i.e., rel="tag") to indicate that the linked-to page acts as a tag for the current context. ^ Some users, however, see tags not as metadata but as "just more content": Berendt, Bettina; Hanser, Christoph (2007). "Tags are not metadata, but 'just more content'—to some people" (PDF). Proceedings of the International Conference on Weblogs and Social Media (ICWSM), Boulder, Colorado, USA, March 26–28, 2007. Menlo Park, CA: International Joint Conferences on Artificial Intelligence. OCLC 799635928. ^ a b c d e Smith, Gene (2008). Tagging: people-powered metadata for the social web. Berkeley: New Riders Press. ISBN 9780321529176. OCLC 154806677. ^ a b c d e f Breslin, John G.; Passant, Alexandre; Decker, Stefan (2009). The social semantic web. Heidelberg; New York: Springer-Verlag. doi:10.1007/978-3-642-01172-6. ISBN 9783642011719. OCLC 506401195. ^ a b Jones, Rodney H.; Hafner, Christoph A. (2012). "Networks and organization". Understanding digital literacies: a practical introduction. Milton Park, Abingdon, Oxon; New York: Routledge. pp. 23–28. ISBN 9780415673167. OCLC 711041611. ^ a b For example, Blogger and WordPress can display tag clouds. ^ a b For example: Leap is a macOS application that features a clickable tag cloud of macOS tags: Hampton-Smith, Sam (12 April 2013). "The pro designer's guide to photo organization". creativebloq.com. Archived from the original on 16 April 2013. Retrieved 10 March 2017. As with all the other options here, meta data can be added to individual files to help improve their find-ability, and uniquely the tag cloud field within Leap's interface allows you to quickly drill down to individually labelled files without fuss. TaggTool is a Windows application that permits tagging files and displaying a tag cloud: Henry, Alan (28 April 2010). "TaggTool: organize your files by keyword". pcmag.com. PC Magazine. Archived from the original on 11 July 2015. Retrieved 10 March 2017. ^ Heymann, Paul; Garcia-Molina, Hector (2006). Collaborative creation of communal hierarchical taxonomies in social tagging systems (Technical report). Stanford University. Summarized in: Heymann, Paul (2006). "Tag hierarchies". infolab.stanford.edu. Archived from the original on 25 June 2016. Retrieved 10 March 2017. ^ Quintarelli, Emanuele; Resmini, Andrea; Rosati, Luca (June 2007). "Information architecture: Facetag: integrating bottom-up and top-down classification in a social tagging system". Bulletin of the American Society for Information Science and Technology. 33 (5): 10–15. doi:10.1002/bult.2007.1720330506. ^ Wu, Harris; Zubair, Mohammad; Maly, Kurt (2007). "Collaborative classification of growing collections with evolving facets". Proceedings of the eighteenth conference on hypertext and hypermedia, Manchester, UK, September 10–12, 2007. HT '07. New York: Association for Computing Machinery. pp. 167–170. CiteSeerX 10.1.1.452.44. doi:10.1145/1286240.1286289. ISBN 9781595938206. ^ Carcillo, Franco; Rosati, Luca (2007). "Tags for citizens: integrating top-down and bottom-up classification in the Turin municipality website". In Schuler, Douglas (ed.). Online communities and social computing: second international conference, OCSC 2007, held as part of HCI International 2007, Beijing, China, July 22–27, 2007: proceedings. 4564. Berlin; New York: Springer-Verlag. pp. 256–264. doi:10.1007/978-3-540-73257-0_29. ISBN 9783540732563. OCLC 184906067. ^ Wilson, Katie (2007). "OPAC 2.0: next generation online library catalogues ride the Web 2.0 wave!". Online Currents. 21 (10): 406–413. ^ a b Yee, Raymond (2008). "Understanding tagging and folksonomies". 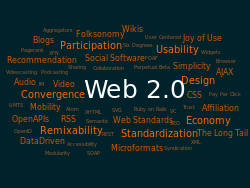 Pro Web 2.0 mashups: remixing data and Web services. The expert's voice in Web development. Berkeley: Apress. pp. 61–75. doi:10.1007/978-1-4302-0286-8_3. ISBN 9781590598580. OCLC 148910044. ^ Willey, Eric (2011). "A cautious partnership: the growing acceptance of folksonomy as a complement to indexing digital images and catalogs". Library Student Journal. Retrieved 10 March 2017. ^ Gerolimos, Michalis (January 2013). "Tagging for libraries: a review of the effectiveness of tagging systems for library catalogs". Journal of Library Metadata. 13 (1): 36–58. doi:10.1080/19386389.2013.778730. ^ Raman, T. V. (1997). Auditory user interfaces: toward the speaking computer. Boston: Kluwer Academic Publishers. p. 107. doi:10.1007/978-1-4615-6225-2. ISBN 978-0792399841. OCLC 37109286. Calling a function defined in one compilation unit from within another is analogous to cross references in large hypertext documents. By using tags tables, the Emacs environment enables the user to turn program source code into powerful hypertext documents. ^ Wempen, Faithe (2010). Teach yourself visually Microsoft Access 2010. Teach yourself visually. Indianapolis: John Wiley & Sons. p. 69. ISBN 9780470577653. OCLC 495271168. You can turn on smart tags for a field to make it easier to cross-reference data between the Access database and Microsoft Outlook (or another personal information and e-mail program) and the Web. ^ Meyrowitz, Norman; Dam, Andries (September 1982). "Interactive Editing Systems: Part II". ACM Computing Surveys (CSUR). 14 (3): 353–415 (366–367). doi:10.1145/356887.356890. EMACS is an M.I.T. display editor designed to be 'extensible, customizable, and self-documenting' [...] Another interesting facility for program editing is the TAGS package. The separate program TAGS builds a TAGS table containing the file name and position in that file in which each application program function is defined. This table is loaded into EMACS; specifying the command Meta, function name causes EMACS to select the appropriate file and go to the proper function definition within that file. ^ "A Description of the Equator and Some ØtherLands". aporee.org. Archived from the original on 18 August 2001. Retrieved 10 March 2017. ^ See, for example: Screenshot of tags on del.icio.us in 2004 and Screenshot of a tag page on del.icio.us, also in 2004, both published by Joshua Schachter on July 9, 2007. ^ Garrett, Jesse James (4 August 2005). "An Interview with Flickr's Eric Costello". Tags were not in the initial version of Flickr. Stewart Butterfield wanted to add them. He liked the way they worked on del.icio.us, the social bookmarking application. We added very simple tagging functionality, so you could tag your photos, and then look at all your photos with a particular tag, or any one person's photos with a particular tag. Soon thereafter, users started telling us that what was really interesting about tagging was not just how you've tagged your photos, but how the whole Flickr community has been tagging photos. So we started seeing a lot of requests from users to be able to see a global view of the tagscape. ^ Mathes, Adam (December 2004). "Folksonomies: cooperative classification and communication through shared metadata". adammathes.com. Archived from the original on 9 March 2017. Retrieved 10 March 2017. ^ Gupta, Manish; Li, Rui; Yin, Zhijun; Han, Jiawei (2011). "An overview of social tagging and applications". In Aggarwal, Charu C. (ed.). Social network data analytics. New York: Springer-Verlag. pp. 447–497. doi:10.1007/978-1-4419-8462-3_16. ISBN 9781441984616. OCLC 709712928. ^ Bray, Tim (1 February 2007). "A Uniform Resource Name (URN) namespace for tag metadata". tbray.org. Archived from the original on 5 November 2016. Retrieved 10 March 2017. ^ "Firefox tip: find bookmarks faster with tags". blog.mozilla.org. Mozilla Foundation. Archived from the original on 12 October 2016. Retrieved 10 March 2017. ^ Hinton, Mark Justice; Obermeier, Barbara; Sahlin, Doug (2010). "Tagging photos". Editing digital photos for dummies. Hoboken, NJ: John Wiley & Sons. ISBN 9780470591451. OCLC 606841528. ^ Siracusa, John (22 October 2013). "OS X 10.9 Mavericks: The Ars Technica Review: Tags". arstechnica.com. Ars Technica. Archived from the original on 9 January 2017. Retrieved 10 March 2013. ^ Cherp, Aleh (17 March 2011). "Tagging". macademic.org. Academic workflows on a Mac. Archived from the original on 30 April 2016. Retrieved 10 March 2017. ^ "Extended attributes and tag file systems". lesbonscomptes.com. 2 July 2015. Archived from the original on 11 August 2016. Retrieved 10 March 2017. ^ Schultz, Greg (23 March 2011). "Tag your files for easier searches in Windows 7". techrepublic.com. TechRepublic. Archived from the original on 29 August 2016. Retrieved 10 March 2017. ^ Gasiorowski-Denis, Elizabeth (22 March 2012). "Adobe Extensible Metadata Platform (XMP) becomes an ISO standard". iso.org. International Organization for Standardization. Archived from the original on 10 March 2017. Retrieved 10 March 2017. ^ Płoszajski, Grzegorz (2017). "Metadata in long-term digital preservation". In Traczyk, Tomasz; Ogryczak, Włodzimierz; Pałka, Piotr; Śliwiński, Tomasz (eds.). Digital preservation: putting it to work. Studies in computational intelligence. 700. New York: Springer-Verlag. pp. 15–61. doi:10.1007/978-3-319-51801-5_2. ISBN 9783319518008. OCLC 969844731. ^ Devcic, Ivana Isadora (9 October 2015). "Tag, you're it! How to manage files on Linux with TagSpaces". makeuseof.com. MakeUseOf. Archived from the original on 28 December 2016. Retrieved 10 March 2017. ^ Finch, Curt (26 May 2011). "Hashtag techniques for businesses". inc.com. Inc. Magazine. Retrieved 10 March 2017. ^ Parry, David (11 March 2007). "Tagging files—or how to keep research organized". academhack.outsidethetext.com. Archived from the original on 2 August 2016. Retrieved 10 March 2017. ^ Smith, Richard (December 2010). "Strategies for coping with information overload". The BMJ. 341: c7126. doi:10.1136/bmj.c7126. PMID 21159764. ^ Bainbridge, Scott; Page, Geoff; Jaroensutasinee, Mullica; Jaroensutasinee, Krisanadej (September 2011). "Towards a services based architecture for real time marine observing data". OCEANS '11 MTS/IEEE Kona, Waikoloa, Hawaii, USA, 19–22 22 September 2011. Piscataway, NJ: IEEE. pp. 740–745. ISBN 9781457714276. OCLC 777270556. ^ Maron, Mikel (5 November 2004). "geo.lici.us: geotagging hosted services". brainoff.com. Archived from the original on 28 April 2007. Retrieved 10 March 2017. ^ Catt, Dan (11 January 2006). "Advanced Tagging and TripleTags". Archived from the original on 18 October 2007. Retrieved 10 March 2017. ^ Straup Cope, Aaron (24 January 2007). "Machine tags". flickr.com. Archived from the original on 20 April 2016. Retrieved 10 March 2017. ^ "The Encyclopedia of Life Flickr group rules". flickr.com. Encyclopedia of Life. Archived from the original on 10 February 2017. Retrieved 10 March 2017. Includes the required use of a taxonomy machine tag. ^ a b c Panda, Mrutyunjaya; El-Bendary, Nashwa; Salama, Mostafa A.; Hassanien, Aboul Ella; Abraham, Ajith (2012). "Computational social networks: tools, perspectives, and challenges" (PDF). In Abraham, Ajith; Hassanien, Aboul-Ella (eds.). Computational social networks: tools, perspectives, and applications. New York: Springer-Verlag. pp. 3–23 [14–15]. doi:10.1007/978-1-4471-4048-1_1. ISBN 9781447140474. OCLC 798568503. ^ a b Wiig, Karl M. (March 1997). "Knowledge management: an introduction and perspective". Journal of Knowledge Management. 1 (1): 6–14. doi:10.1108/13673279710800682. ^ Alavi, Maryam; Leidner, Dorothy E. (February 1999). "Knowledge management systems: issues, challenges, and benefits". Communications of the AIS. 1 (2es): 1. ^ Golder, Scott A.; Huberman, Bernardo A. (April 2006). "Usage patterns of collaborative tagging systems". Journal of Information Science. 32 (2): 198–208. doi:10.1177/0165551506062337. ^ Devens, Keith (24 December 2004). "Singular vs. plural tags in a tag-based categorization system (such as del.icio.us)". keithdevens.com. Archived from the original on 10 May 2012. Retrieved 10 March 2017. ^ a b Halpin, Harry; Robu, Valentin; Shepherd, Hana (2007). "The complex dynamics of collaborative tagging" (PDF). Proceedings of the 16th international conference on World Wide Web, Banff, Alberta, Canada, May 08–12, 2007. WWW '07. New York: Association for Computing Machinery. pp. 211–220. CiteSeerX 10.1.1.78.5341. doi:10.1145/1242572.1242602. ISBN 9781595936547. OCLC 173331796. ^ Körner, Christian; Benz, Dominik; Hotho, Andreas; Strohmaier, Markus; Stumme, Gerd (2010). "Stop thinking, start tagging: tag semantics emerge from collaborative verbosity" (PDF). Proceedings of the 19th International Conference on World Wide Web, Raleigh, North Carolina, USA, April 26–30, 2010. WWW '10. New York: Association for Computing Machinery. pp. 521–530. doi:10.1145/1772690.1772744. ISBN 9781605587998. OCLC 671101543. ^ Heymann, Paul. "Tag spam". stanford.edu. Stanford University. Retrieved 10 March 2017. ^ "Microformats wiki: rel='tag'". microformats.org. 10 January 2005. Retrieved 10 March 2017.